How can I know if my reservation has been confirmed? Whether you made the reservation through our website or by email, you should receive an email confirmation about your reservation within 24 hours of your request. Please check your spam/unwanted mail folder. All the reservations are confirmed within 24 hours. Please check your spam/unwanted mail folder. If you haven’t received an email confirmation, get in touch with us by calling +34952792635 (from Monday to Friday, 9-14’00 and 16-20’00, Saturdays, 9-14’00) or +34667710369 if you cannot wait. Can I reserve a vehicle for today? To reserve a vehicle on the same day, you should do so by calling +34 952 79 29 35 or our mobile phone +34 667 710 369 and we’ll confirm your reservation, if we have vehicles available. Must I pay when I make a reservation? No payment will be charged when you make the reservation. Once we give you the car, the payment will be made on your credit card (Visa, MasterCard or American Express). Where can I see the general conditions about hiring a car? You can read the general conditions by clicking here. Can I drive my car outside Andalusia? It is not permitted. The rented vehicle is only authorized to drive in the autonomous community of Andalusia and Gibraltar (this doesn’t include Ceuta, Melilla, Morocco, etc). What happens with traffic fines? If we receive a traffic fine we are obliged by law to communicate the details of the driver as listed on the rental contract, but we don’t charge the client for this. You need a passport or valid identity card, driver’s license and credit card. From what age can I rent a car? The renter, and all additional drivers, must be at least 25 years old and have a driver’s license at least 2 years old. The price includes the rental of the vehicle or van, VAT and insurance with excess. The insurance included in the prices on our site is a fully insured plan with no excess (with the exception of cargo vans -groups M, N, O and V- which do have an excess). In the case that the vehicle suffers an accident during the rental, the renter must pay damages up to a maximum quantity equal to the amount of the excess. This amount varies depending on the value of the vehicle rented. What extras can I reserve with ESPACAR? With how much gas do I receive my vehicle? The vehicle is delivered to you with half a fuel tank and must be returned with the same amount. If the vehicle is returned with less fuel, we will charge it to the credit card. What happend if my flight is delayed? We will know if there are any delays with your flight and will be waiting for you at the time of your arrival. For this, please provide us with your flight number, as this will help us know the exact time of your arrival. Is there an extra charge for after-hours? - A supplement of €20 for deliveries from 20:00 - 22:30. - A supplement of €25 for deliveries from 22:30 - 9:00 the next day. What happens if the car breaks down or is in an accident? All our contracts provide a 24x7 roadside assistance service with multi language capacity. You can find the contact telephone number in your paper copy of the contract. You may also call us at +34 952 79 29 35 during office hours (Monday to Friday from 9:00 - 14:00 and 16:00 - 20:00) or at +34 667 710 369 at any other time. Can I extend the rental of the car once I’ve signed the contract? The rental can be extended if the vehicle is available but you’ll need to pass by our offices to sign the new contract. You can take pets with you in the car as long as you protect the seats. An additional interior cleaning fee may be charged depending on the state of the car when returned. How do I pick up the car from the Malaga airport, Gibraltar airport or Malaga Renfe station? 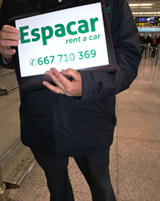 We’ll be waiting for you with a sign reading ESPACAR in the arrival hall (Terminal 3). We’ll be on the left side, just below the flight information panels. If you arrive and our staff hasn’t arrived yet, wait for them next to the information panel and you’ll be taken to your car. We’ll wait for you inside the public parking lot, FOCONA, located on Avenida 20 de Abril. From the Gibraltar airport to the parking lot there’s a distance of about 200 metres. There, our staff will accompany you to your vehicle and explain everything you need to know. At the María Zambrano train station we’ll be waiting for you with an ESPACAR sign at the platform exit (next to the lifts). What if my reservation is confirmed but when I arrive no one from ESPACAR RENT A CAR is waiting for me? If this happens during our office hours (Monday - Friday from 9:00 - 14:00 and 16:00 - 20:00) call us on +34 952 79 29 35. Outside these hours you can contact us on +34 667 710 369. Can you deliver my car to my address or hotel? Yes, we offer that service but you need to ckeck with us availabitlity and prices in advance. Where and how do I return the vehicle to the Malaga airport? 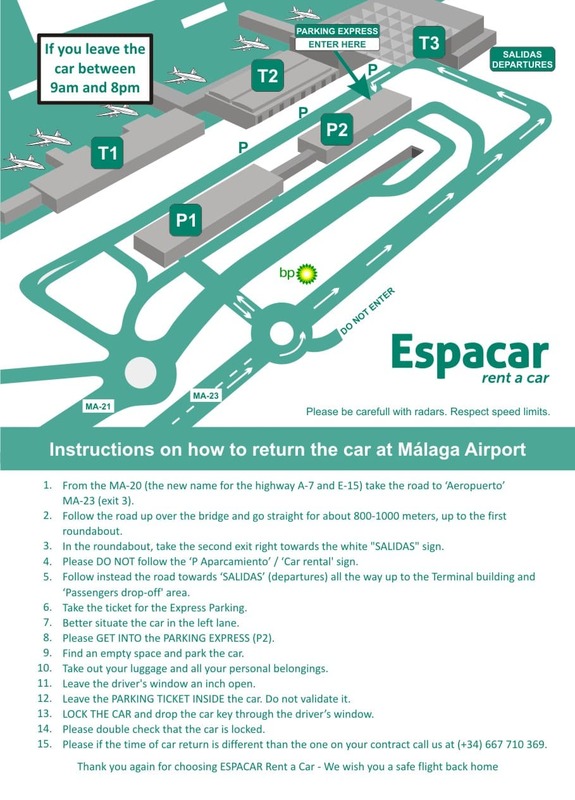 To return the vehicle to the Malaga airport, you should leave it in the public parking lot of the airport. 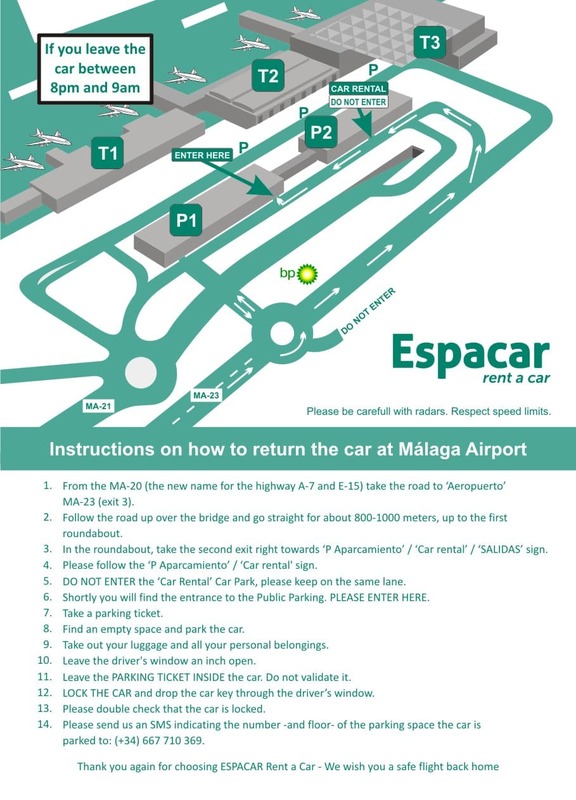 The day of your arrival, the staff of ESPACAR who receives you in the airport will explain exactly where and how to return the car. Where and how do I return the vehicle to the Gibraltar airport? To return the vehicle to the Gibraltar airport, you should leave it in the public parking lot, FOCONA, in Avenida 20 de Abril, located about 200 meters from the airport (it’s the lot where you’ll receive the vehicle on your arrival). We have 30 ESPACAR spots in this parking lot, which are marked so that you can park the vehicle there. Once parked, you should hand the keys to the staff at the FOCONA parking lot. Where and how do I return the vehicle to the Malaga Renfe station? To return the vehicle to the Malaga Renfe station, you should leave the vehicle inside the public parking lot at the station, parking it on floor -1 or -2. Whoever receives you upon your arrival will also explain to you how to return the vehicle. Can I return the vehicle in another city different from where I picked up the vehicle? - Gibraltar airport (parking Focona, on Avenida 20 de abril, in la Línea de la Concepción). - María Zambrano train station. We can also pick up the vehicle from your local address between Marbella and Sotogrande (only if it’s on the coast). Whoever signed the contract is allowed to drive the vehicle, as long as they meet the requirements of ESPACAR, i.e. at least 25 years old and with a driver’s license of at least 2 years. A companion can also drive the vehicle as long as ESPACAR is informed and all required documentation is provided. The kilometres are unlimited, bearing in mind that you can only travel in Andalusia and Gibraltar.